Adam Fidgett ended up in hospital. Nene Valley Harriers’ veteran athletes are well on their way to the Eastern Masters League end-of-season finals after a successful evening of track and field athletics at the Embankment on Monday night. Their men won the North Division match and lead the overall standings with one meeting to go, but there was the odd mishap along the way. 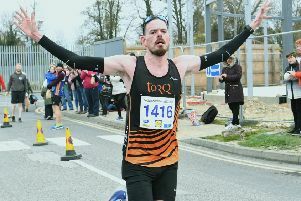 Long-distance runner James Macdonald was enjoying an afternoon nap following a relaxing four-pint lunch when his phone rang to remind him of an event which had completely slipped his mind. Mcdonald then proceeded to equal his personal best (PB) of 4:54.1 when finishing third in the Over 35 1500m and followed this up with a win in the 2km walk. His results left the club coaches scratching their heads at the fine form displayed following such an unorthodox approach. Versatile all-rounder Adam Fidgett came a cropper in the high jump, cutting his head open on the bar, and he was taken to hospital to have stitches inserted in the wound just five weeks before his wedding. The men’s match was a close run thing, and although Peterborough AC finished fourth they were hot on Nene Valley’s heels all evening. Julian Smith won the Over 35 100m in a time of 12.1 and his Nene Valley clubmate Ricky Huskisson was just half a second slower when winning the Over 50 100m. Dave Brown cruised to victory in the Over 35 400m with a 53.5 clocking. Peterborough AC enjoyed plenty of track success with Dave Whitehead first in the Over 60 400m in 68.0, and Duncan McGrory producing a stunning run to win the Over 60 1500m in 4.55.5. That was only 23 seconds slower than predictable Over 35 winner Steve Robinson. Nene Valley’s Simon Achurch was a comfortable winner of the Over 35 shot and hammer with distances of 43.12m and 11.72m respectively while PAC man Karl Eve threw 9.94m to place first in the Over 50 shot. The ladies match was won by Ryston Runners with Nene Valley second and PAC fourth. These results echo the overall standings, and with the first two teams guaranteed to reach the finals Nene Valley are almost there. Team captain Claire Smith led the way for Nene Valley clocking 13.7 when winning the Over 35 100m and the 400m in 63.8. Yvonne Scarrott ran 84.0 to place first in the Over 50 400m. Andrea Jenkins took complete control in the Over 35 hammer with a throw of 45.46m. Jenkins also won the shot with a putt of 9.63m. Judith Jagger enjoyed her usual success for PAC winning the Over 50 shot with 8.49m and the triple jump with a leap of 7.03m.